Do you set goals for yourself? What are your goals for the next 1 year? How about 3 years from now? 5 years? 10 years? What are your aspirations in life? Goal setting is the first step of successful goal achievement. It marks your first point toward success. It’s when you switch from a passive state to being involved in life. 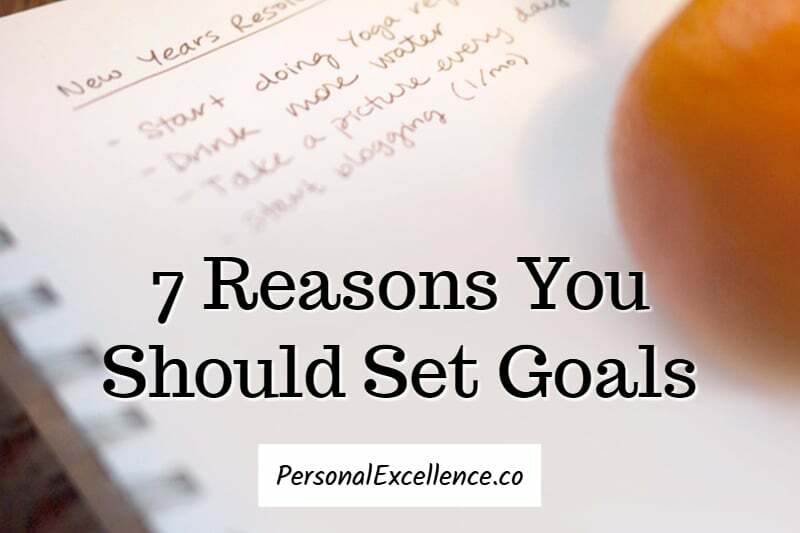 Here are 7 reasons why it’s important to set goals. Many people today are sleepwalking through life. Even though they work hard, they don’t feel like they are getting what they want. That’s because they don’t have a direction of where they want to go, what they want to achieve. Students graduate and they’re not sure what to do with their life; adults work for years and are shocked when they reach their 30s/40s and they don’t know what to do next. As Bill Copeland says, when you don’t set goals, you can spend your whole life running up and down and not achieve anything. In reality you’re just fulfilling others’ goals, not yours. It can be the fast food industry telling you to eat fast food because you’re “lovin’ it.” It can be the consumer goods industry telling you that you need this shampoo with 79% frizz-reduction formula because it’ll make your life better. It can be fashion labels getting you to buy their clothes because you supposedly look cooler in them. When you stop to set goals and think about what you want, you break out of auto-pilot and start living a life of your conscious creation. Instead of letting others tell you what to do, you proactively take charge and think about what you want for yourself. Top performers, world-class athletes, and successful people all set goals. Michael Phelps (competitive swimmer and most decorated Olympian of all time), Kobe Bryant (NBA star), Mark Zuckerberg (co-founder of Facebook), Richard Branson (business magnate), and Elon Musk (CEO of SpaceX and Telsa Motors) all set goals. That’s because when you set goals, you have a vision to work toward. You ensure that you are pushing yourself to get the best results, rather than resting on your laurels and waiting for things to happen. Know that what gets measured, gets improved. If you don’t set specific targets and milestones, how are things going to improve? There is literally nothing to work toward, and even though you may be working hard, your hard work may not translate into anything. As the popular saying goes, “Shoot for the moon. Even if you miss, you’ll land among the stars.” When you set goals, you are aiming for the moon. Your goals propel you to take more action that you would have otherwise. What do you want to see 1 year from now? How about 3 years from now? 5 years? When you set goals, you think ahead, after which you can create your action plan. Even if things don’t go according to plan, that’s okay as you can review, adjust your plans, and then steer your life toward your vision. Know that all things are created twice: first in the mind, then in the physical world. The mental creation happens when you set your goals. The physical creation happens when you work on your goal and bring it to life. Without the mental creation, the physical creation can’t happen. When you set goals, you kick off the very first step to make your dreams happen, after which the next steps will follow suit. Goals give you focus. While a life purpose gives you a general direction, your goals give you laser focus as to what exactly to spend your time and energy on. Let’s say you set a goal to create a pastry business. Even though you have no idea how to make it happen, the very act of setting a goal gives you a focal point. As you brainstorm for ideas, you realize that you can start by studying the local pastry market and pastry brands. Understanding the pastries that people like. Then, take baking classes to master your skills. At the same time, test recipes and let your friends taste your creations before selling them. Think of your energy as the input and the results as the output. When you have a goal, you create a focal point where your energy can be channeled to create maximum reward. For example, a goal to achieve 5,000 visitors/day on your blog helps you prioritize and identify the most important tasks to achieve this traffic target, while eliminating low-value tasks that do not contribute to this vision. Same for a goal like to achieve straight A’s — here you prioritize and identify the key action steps to get top grades, such as picking the best class combination for optimal grades, studying past year exam papers, consulting your professors, and having a study timetable, while eliminating time wasting tasks like excessive use of social media and binge-watching TV shows. This then creates maximum results. Having goals makes you accountable. Rather than just talk, you are now obligated to act. This accountability is accountability to yourself, not anyone else. No one knows the goals you set. People also don’t stand to gain even if you achieve your goals. By setting specific targets, you can easily see if you are on track, and if not, what to do about them. When I started my blog Personal Excellence years ago, I set goals such as to complete a certain number of articles a week, to hit a certain traffic target a week, and to get a certain number of clients a month. This made me accountable to these targets. Each week, I would monitor my performance while working on my plan. If I found myself falling short, I would take the necessary steps to address it. I would cut out my Quadrant 4 tasks (time wasters) and identify the 80/20 actions to achieve my goals. Doing so helped me grow my blog very quickly, and within a year I was able to turn my passion into my full-time career. When you set goals, you connect yourself with your innermost desires. They help motivate you and give you something to strive for. This is especially powerful if you’re not in a good place in life at the moment — your goals help remind you of the things you love, to redirect your focus away from the negative obstacles, and to reconnect you with your innermost desires. To quote Henry Ford, “Obstacles are those frightful things you see when you take your eyes off your goal.” When you are feeling negative and down, it’s often because you feel you’ve nothing worth looking forward to. Your goals are the rainbow to strive for, to push you out of the storm. Goals help you achieve your highest potential. Without goals, you default to a routine of activities that keeps you feel safe and comfy each day. But this familiarity is the nemesis of growth. It prevents you from growing. It denies you from tapping into your infinite potential. By setting goals, you set targets to strive toward. These targets make you venture into new places and new situations that put you into growth mode. They make you stretch beyond your normal self and reach new heights. For example, setting a time limit for your run lets you know if you should be running faster. Setting a weight loss target helps you know if your actions have been effective in losing weight. Setting a career goal ensures that you are not settling for anything less than what you desire. Last but not least, goals ensure that you get the best out of life. Whether you want this or not, time will pass in your life. In 1 year’s time, you’ll be 1 year older. In 5 years’, you’ll be 5 years older. Goals with specific measures and deadlines ensure that you are maximizing your experience on earth. If you have already discovered your life purpose, your goals will help you get the best out of your purpose. Imagine this: The world is your oyster. There are millions, billions of things you can do, experiences you can have, and people you can encounter. There are endless possibilities of what you can accomplish. What if you can do whatever you want? What do you want to achieve? What do you want to see, do, and experience in your life? Set your goals, make them happen, and watch as you create your best life ever. Ask yourself this: What are my goals for the upcoming 1 year, 3 years, 5 years, or even 10 years? My bucket list article of 101 Things To Do Before You Die, where you create your list of things that you want to do before you die.